Call your own shot on thousands of items on GunBroker.com. GunBroker.com is modernizing our buying and selling experience allowing sellers to entertain offers from buyers on fixed price items. Buyers are encouraged to TAKE A SHOT by making offers on items from participating sellers. Buyers TAKE A SHOT by submitting offers that are good for 48 hours. During that time the buyer is committing to purchase the item at the TAKE A SHOT price. Sellers will review the SHOTS then opt to accept or decline them. Sellers can receive multiple SHOTS on the same item and can accept any or all depending on the quantity of the item they have for sale. If the seller accepts the SHOT the sale is completed through standard GunBroker.com processes. If the seller declines the SHOT or does not act on that SHOT within 48 hours, the offer expires and the buyer is no longer committed to the purchase. TAKE A SHOT allows the flexibility of naming your own price and the rewards of negotiation. This new experience creates another great way to buy and sell on GunBroker.com. Join the excitement and TAKE A SHOT today! What is it really worth? 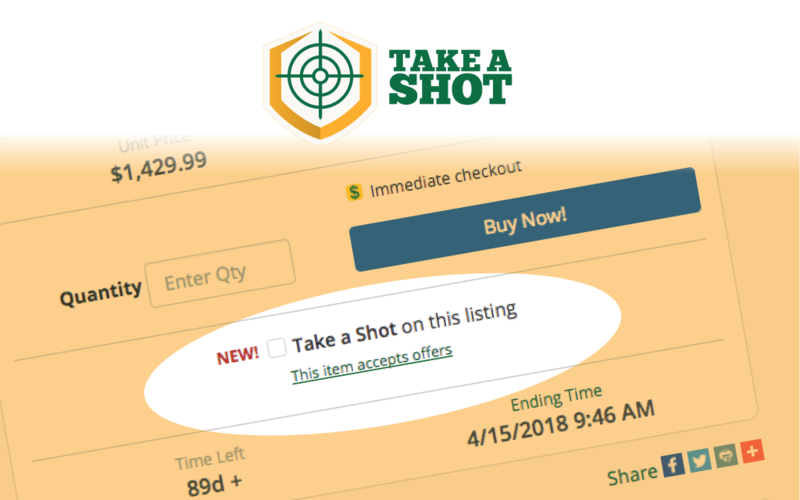 Learn how to TAKE A SHOT on an item listing today! Learn how to setup TAKE A SHOT on your listings and sell more today!